I must admit I’m a bit of a word nerd. I love words and their origins, and this fantastic activity book engages kids in thinking about where words come from. It’s full of funny, clever and engaging quizzes, puzzles and anecdotes that will get kids thinking and laughing and learning without even realising it. Speaking of word origins, did you know that around 500 years ago there lived a giant baby named Gargantua who was so big that his pram was a horse bigger than six elephants. And when he needed to wee, the yellow ocean drowned the people of Paris. 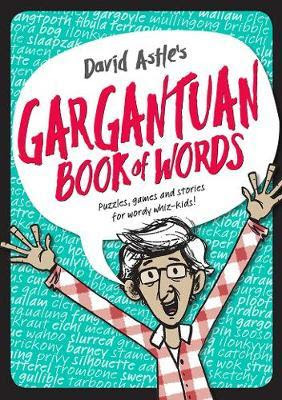 Thanks to this super story we have the word gargantuan in the dictionary and the name of this book. The fun and quirky approach will appeal to kids whilst educating them on word origins and connections. The puzzles and quizzes include guess the phobia meanings, ghostly riddles and interpreting old English words and are designed to get them thinking more deeply about the language we take for granted. The book has a range of activities and facts that will appeal to various ages and reading levels. Some simple ones for the younger readers (7 – 8) as well as interesting facts and sayings to appeal to older kids (and even adults!). Paul Tippet’s great illustrations add to the appeal and the fun feeling of this great activity book. There is a whole section on toilet humour thrown in so be prepared for your average eight year old to giggle through all the different words for toilet and where they have come from, as well as challenging their toilet knowledge with the toilet name quizzes. To balance out the toilet humour, there is also a section on words from around the world. This includes interesting tidbits such as the Polish war hero Mount Kosciuszko was named after (and yes, apparently it is supposed to have the 'z' in it), where Ikea products get their names and various countries' versions of the saying 'it's raining cats and dogs'. This is a fantastic activity book for the word nerd in your life, or any child really as most kids are curious about language and where it comes from. It is filled with funny riddles and clever puzzles as well as interesting information such as crazy long words, sayings from around the world and an introduction to the way different countries express things (and the realisation that the meaning is often much the same as in our own language).